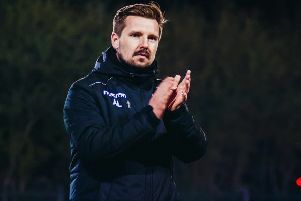 Sheridan levelled for relegation rivals Ashton United with a free-kick just four minutes after Kingsley James had broken the deadlock with a thumping penalty, awarded for handball. This was a crucial match for both sides with Guiseley holding a four-point advantage going into the game, as they looked to move a big step closer to securing their National League North status. Ashton made a bright start and should have taken the lead with 10 minutes gone as a free-kick that was floated in was not cleared and fell to Connor Dimaio. His effort on the half-volley hit the bar and was eventually cleared. Guiseley started to get into the match as well, with Will Hatfield seeing a goal-bound effort cleared away by Matt Regan. There were a lot of nerves around both teams as chances were few and far between, with James seeing an effort from 25 yards out go wide for the hosts. Dimaio would again go close this time in the second half. He was found in the area but his low drive hit the side-netting. The hosts took the lead after a handball was awarded against Ashton and James made no mistake scoring from the spot with a calm finish for the home side. Ashton though equalised moments later, Sheridan firing in a superb free-kick from 25 yards out that curled into the bottom right-hand corner. After that the two sides could not be separated. The Lions travel to play Blyth Spartans on Good Friday, in a match where they could secure their status in the league with a positive result. Bradford Park Avenue got back to winning ways after four matches without a victory to consolidate their position in the top seven with a 1-0 home triumph over relegated Nuneaton. The only goal of the game was scored when half-time substitute Oli Johnson sent in a cross and Jake Beesley was brought down, with the latter finding the top corner from the penalty spot on 55 minutes. Beesley went on to head against the underside of the crossbar and Nicky Clee saw a chipped effort cleared off the line. York City’s faint mathematical hopes of reaching the National League North play-offs were extinguished by a 2-2 draw at Chester. The Minstermen led twice through efforts from midfield pair Adriano Moke and Paddy McLaughlin but were forced to settle for a share of the spoils after Sean Newton’s own goal and a George Waring effort. Meanwhile, in the National League, Harrogate Town remain in sixth place following a 1-0 home defeat to Boreham Wood. Tom Champion netted the winner for the visitors in the ninth minute. Devante Rodney’s fifth goal in nine games wasn’t enough to help FC Halifax Town claim victory as they were twice pegged back to draw 2-2 with Bromley at the Shay. Josh Staunton’s first-half goal was cancelled out after the restart by Josh Coulson, but after Town had regained the lead, Richard Brindley brought the visitors level again.